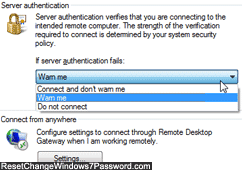 Whenever you connect to another computer or server using the Windows 7 remote desktop client, you'll have the option to make it remember your credentials, and a series of matching IP addresses. But as you'll learn in this tutorial, the connection dialog also lets you change part of the settings on-the-fly. First, launch the remote desktop client, and select the IP address of the destination PC (from dropdown). The User name field is un-editable (otherwise, we're talking about a different set of credentials altogether). Click on the "edit" link below the user's name, and the "Windows Security" dialog will open: enter the new password and hit Enter. (Editing allows you to save the connection but update it, whereas selecting "delete" will force you to re-enter everything) Tip: to use another connection to that machine, click on "Use another account" and start over with new credentials. 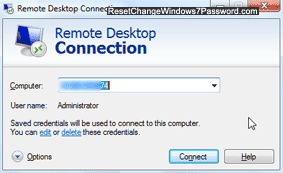 If you want to change that connection's settings, click on the "Options" expander button in the lower left corner of the remote desktop dialog: to force it to delete the stored password, click on the "Always ask for credentials" checkbox, and click on the "Save" button (or "Save As" to create a different connection). Selecting "Advanced" from the tabs that appeared at the top, you can also customize how Remote Desktop will handle authorization problems: click on the "If server authentication fails" dropdown, and select another option ("Warn me" is the default). Click on "Settings" to configure advanced or non-standard connection configurations. Once you are done, click on the "Connect" button, and Remote Desktop will automatically save your updated credentials if you so chose.